New Delhi, 29 June, 2017: Midea Group, a Fortune 500 company, today announced plans to invest ₹ 800 Crore to set up a manufacturing facility near Pune. The company will acquire 43 acres of land in Supa Parner Industrial Park II. Mr. Andy Gu, Vice President, Midea Group, made the announcement of a greenfield manufacturing facility for consumer Home Appliances and components. The products manufactured at the plant will cater to Midea Group’s operations in India as well as others. The facility will also evaluate export for Midea Group to other distribution locations. 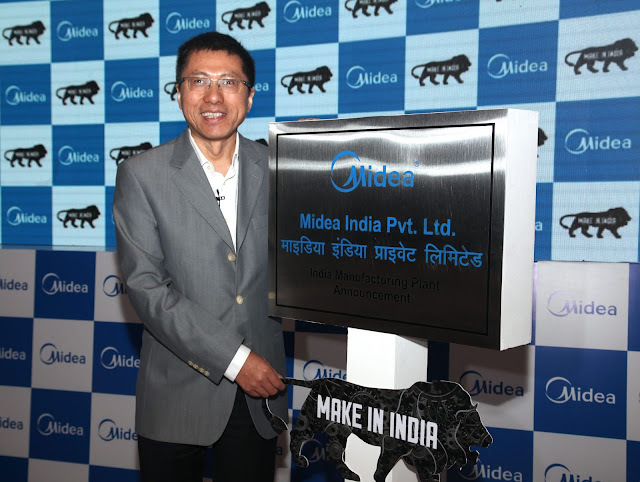 In line with Prime Minister Narendra Modi’s ‘Make in India’ vision, Midea Group has earmarked an investment of ₹ 800 Crore for the new facility which is expected to generate 500 jobs over 5 years. The state of the art, greenfield manufacturing facility will have a dedicated R&D centre which will design, develop and test products for the Indian market. The new facility is expected to commence commercial operations by end 2018 and is an exemplary showcase of Midea Group’s long-term commitment to the Indian market. § Production lines for home appliances including Refrigerators, Washing Machines and Water Appliance products. § The plant will have a capacity to manufacture Five Lakh refrigerators, Six Lakh washing machines and Ten Lakh Water Appliances products. § Stringent environment and safety standards will be used to ensure that the India manufacturing facility is at par with global operating standards. Midea Group is a leading global player in consumer appliances, Heating, Ventilation and Air Conditioning (HVAC) systems, and robotics and industrial automation systems. Midea offers diversified products, comprising of consumer appliances (Kitchen Appliances, Refrigerators, Laundry Appliances, and various Small Home Appliances) and robotics and industrial automation. Midea is committed to improving lives by adhering to the principle of “Creating Value for Customers”. Midea focuses on continuous technological innovation to improve products and services, and to make life more comfortable and pleasant. Founded in 1968 in Guangdong, China, Midea has now established a global platform of more than 200 subsidiaries, over 60 overseas branches and 10 strategic business units, as well as being the majority shareholder of Kuka (95% shareholding). In 2016, Midea Group was listed in Fortune Global 500. The sales revenue of Midea was nearly US$ 24 Billion in 2016. Midea has hundreds of millions consumers, major customers in different areas, strategic partners worldwide and about 130,000 employees in total.